Say goodbye to sad sandwiches and wilted salads! These easy recipes will save you time and keep you satisfied until dinner. Lunch is the red-headed stepchild of meals. 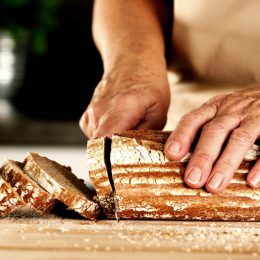 Think about it: When was the last time you really got excited to prepare and eat an impressive midday bite? 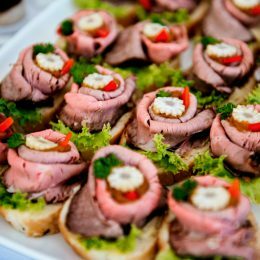 Your same old sandwich or salad may serve its purpose, but you might be surprised by how much a lunch upgrade can brighten up your afternoon. Not convinced? Give a few of the batch recipes below a try! All come highly recommended by top nutrition experts and food bloggers. 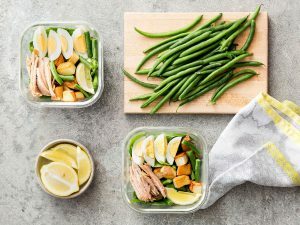 “This lunch includes protein- and fiber-packed chickpeas, along with a hearty serving of veggies and a bit of feta and lemon-yogurt dressing for an extra punch of flavor,” says Virginia-based dietitian and wellness consultant Tina Gowin Carlucci, R.D.N. Her expert tip: “Wait to stuff the pita pockets until just before eating.” It’ll prevent the pita from becoming soggy come lunchtime. What to do: Mix together tomatoes, cucumber, chickpeas, the juice of half the lemon, extra virgin olive oil, and parsley. Add salt and pepper to taste. Divide evenly among five containers with lids. In a separate bowl, mix together yogurt, the juice of the remaining lemon half, and salt and pepper to taste. Divide evenly among five small containers with lids. For each day of the week, grab a container of the chickpea mixture, and toss in one ounce of feta cheese. Take a container of the yogurt dressing and a whole wheat pocket pita. At lunchtime, stuff each pita half with the chickpea-feta mixture, and drizzle with yogurt dressing as you eat. 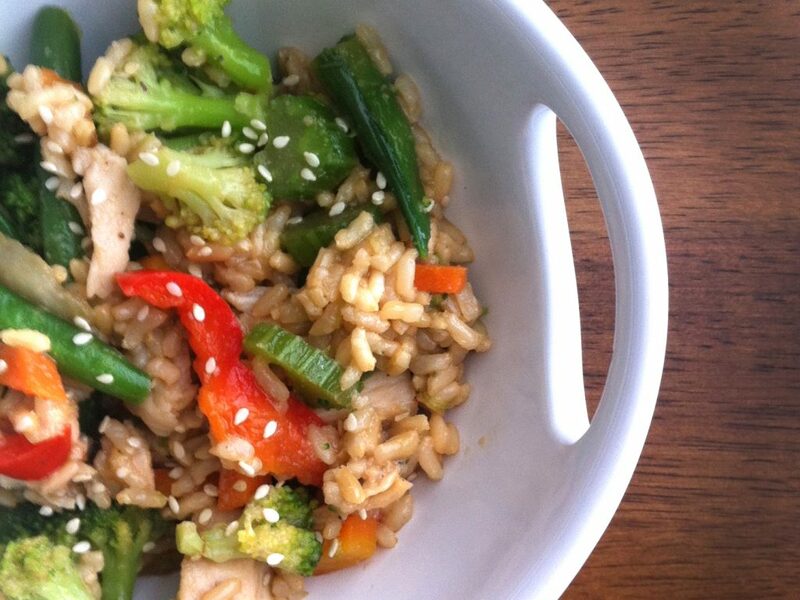 Lindsey Joe, R.D.N., a spokesperson for the Tennessee Academy of Nutrition and Dietetics, often relies on this quick fried rice—inspired by her mother’s recipe—for easy weekday meals. 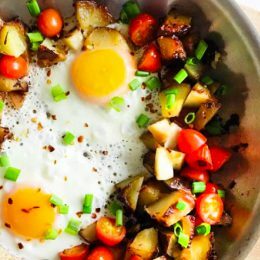 “It’s a quick cook and a nutritionally balanced meal that includes all the food groups, from protein-rich eggs and shrimp to complex carbohydrates from the brown rice,” she says. What to do: In a lightly oiled pan, sauté the vegetables until the onions are translucent. Move the vegetables to the sides of your skillet, and pour in the eggs to scramble. Once the eggs are cooked, add in the rice, chicken or shrimp if using, and oyster sauce. Stir the mixture until ingredients are incorporated. Store in a large container until ready to eat. This salad comes straight from the pages of The Healthy Meal Prep Cookbook by Toby Amidor, M.S., R.D., nutrition expert and author of The Greek Yogurt Kitchen, who loves it for being packed with protein. “As for the dressing, either place it on the bottom of the container or carry it on the side,” she suggests. This will help you avoid a soggy salad. Photo: Copyright Toby Amidor, The Healthy Meal Prep Cookbook: Easy and Wholesome Meals to Cook, Prep, Grab, and Go, Rockridge Press, 2017. Photo courtesy of Nat and Cody Gantz. What to do: Preheat oven to 350 degrees. Coat a baking sheet with cooking spray. In a small bowl, toss potatoes with olive oil and salt. Spread the potatoes in a single layer on the baking sheet. Roast until golden brown and tender, 20 to 25 minutes, and set aside to cool for 10 minutes. While the potatoes are roasting, bring a pot of water to a boil over high heat. Reduce the heat to low, then add your eggs and cook seven to eight minutes. Drain and cool in ice water for about 10 minutes. Peel and slice into quarters lengthwise. In each of four glass containers, put one cup spinach. Top each with ¼ cup potatoes, four egg quarters, ¼ cup each of green beans and tomatoes, and ½ can of tuna (with oil). Sprinkle each with the black pepper, and add a lemon wedge. When ready to eat, squeeze the lemon juice on the tuna. Store each sealed container for up to five days. “This hearty soup is packed with protein and soluble fiber, so it’s filling enough for a meal but still leaves you feeling light,” says Michelle Dudash, R.D.N., a Cordon Bleu-certified chef and author of Clean Eating for Busy Families. Try it for an especially warming and cozy lunch during the cold months. Dudash suggests adding a hefty squeeze of lemon or lime on top for a good dose of vitamin C, plus diced avocado for some healthy fats. 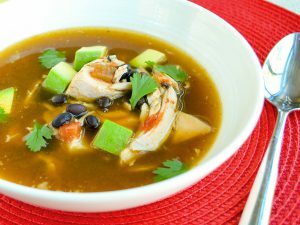 What to do: Heat salsa, chicken broth, black beans, and Southwest seasoning in a pot. Meanwhile, cut the chicken into pieces. The bones actually add a lot of flavor, so you can include the legs, thighs, etc. Add the chicken to the pot, and simmer for about 15 minutes to allow the flavors to blend. Store the soup in a large, freezer-friendly container. When ready to eat, place broken tortilla chips into a bowl, ladle in the reheated soup, and top with avocados and lime juice. What to do: Mix arugula, lentils, quinoa, sliced almonds, olives, and avocado in a large bowl. Top with salt, pepper, and cranberries if using. Store in a large airtight container, or portion into four or five individual containers. Mix the olive oil and lemon juice, and keep the dressing in a separate container until ready to eat. Large batch soups are some of the easiest make-ahead meals. Packing in an entire cup of dried split peas, this one is brimming with filling fiber and plant protein, says Kaleigh McMordie, R.D.N., author and recipe developer of Lively Table. There’s some bacon in there too, but the soup is just as tasty without the meat. What to do: In a heavy-bottomed pot, add bacon pieces and cook, stirring, over medium-low heat until bacon is crispy. Remove bacon from pot to a paper towel-lined bowl to drain. Wipe out the grease with a paper towel, leaving just enough to coat the pot. If omitting the bacon, add olive oil to heavy-bottomed pot. Add onion, garlic, celery, and parsley to the pot, and sauté until soft and fragrant, about five minutes. Add split peas, potatoes, salt, pepper, and stock. Stir and bring to a boil. Reduce heat, and simmer 45 minutes or until peas are soft. Turn off heat and transfer everything in the pot to a blender, or use an immersion blender to purée until smooth. If you use a regular blender, be sure you don’t completely seal the lid on top—it may explode with hot soup. 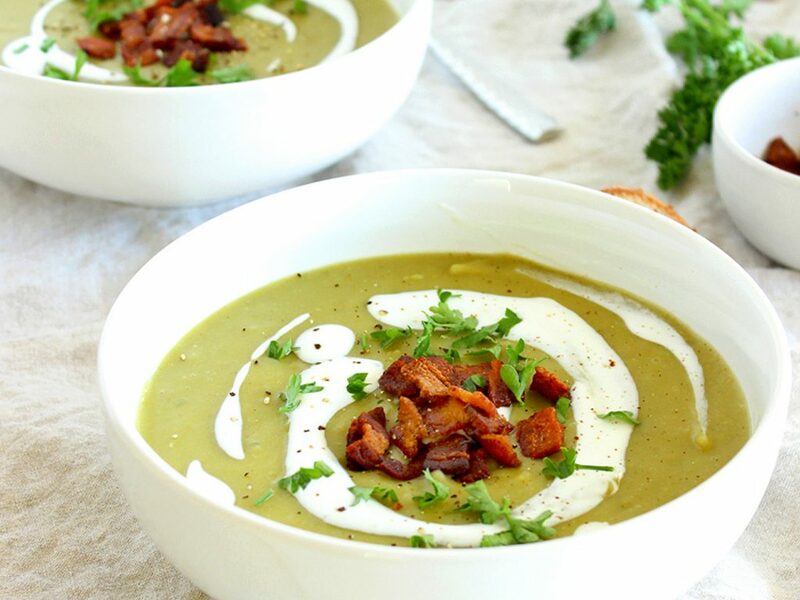 Let soup and bacon cool, and refrigerate separately. When you’re ready to eat, ladle soup into a bowl, reheat, and garnish with bacon, parsley, and sour cream or Greek yogurt. What to do: Heat canola oil in a large pot over medium-high heat. Add garlic and stir constantly for 30 seconds to one minute, or until fragrant. Add onion, plus a sprinkle of salt and pepper, and sauté until translucent, about seven to 10 minutes. Pull out one to three chipotle peppers from the adobo sauce (depending on how spicy you’d like your chili to be), and carefully dice them. Add to the sautéed onions, and stir to combine. (Tip: Freeze the remaining chipotle peppers and adobo sauce for future use). Add all bell peppers to the pot, and cook for about five minutes or until slightly softened. Add the diced tomatoes, beans, chili powder, and cumin. Stir to combine. Slowly add water to the pot. You want to add enough so all the ingredients are touching water but aren’t drowning; you may not use all two cups. Cover the pot and allow chili to simmer for 20 to 30 minutes, stirring occasionally. Divide chili among five microwave-safe containers, and store in the refrigerator for lunches throughout the week. Feel free to add optional toppers like shredded cheese, Greek yogurt, or chopped scallions after reheating. Like the chili above, the flavors in this recipe get even better the longer they marinate. It may include pasta, but thanks to the grilled chicken and mozzarella, it still makes for a protein-packed lunch, McMordie says. What to do: Cook pasta according to package directions. Drain and cool. Cut cooked chicken breast into one-inch cubes. 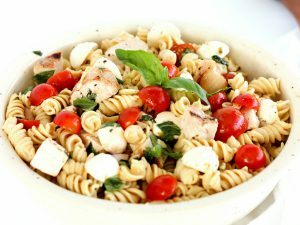 In a large bowl, combine pasta, chicken, tomatoes, mozzarella, and basil. In a small bowl or glass measuring cup, whisk together remaining ingredients. Pour over pasta mixture and gently stir to coat. Cover and refrigerate until ready to serve. Far from a standard pile of leaves, this hearty quinoa salad is a great way to pack more vegetables into your day, McMordie says. Roasting the kale and eggplant brings out their natural flavors. The dish is perfect on its own, but can also be paired with any leftover protein for an even more filling meal. What to do: Preheat oven to 425 degrees. Line two baking sheets with parchment paper. Cut eggplant into uniform one-inch cubes. Toss with ½ tablespoon olive oil, and spread onto one of the baking sheets. Chop kale into uniform pieces. Toss kale with the other ½ tablespoon of olive oil, and spread onto the other baking sheet, along with the pine nuts. Roast kale and pine nuts for 10 minutes, or until crispy but not burned. Roast eggplant for 20 minutes, stirring every five minutes or so. Meanwhile, rinse the uncooked quinoa. Mince garlic, and add quinoa, garlic, broth, and water to a medium saucepan. Simmer over medium heat for about 15 minutes, or until the quinoa has soaked up all the water. Thinly slice the basil leaves into ribbons, and prepare dressing by mixing with the lemon juice and olive oil. 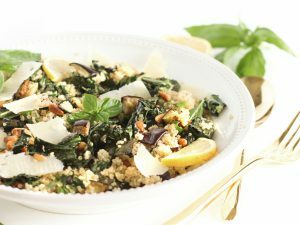 In a large bowl, toss together the cooked quinoa, eggplant, and kale. Add dressing, parmesan, and basil. Season with salt and pepper to taste. Serve hot or cold. The salad can be stored in the fridge for up to five days.